This is your last chance to see Santa Claus parade down a street in London until next year! Whether this will be your first or your third parade of the year, it’s sure to be one you won’t want to miss. This Christmas is for Kids! 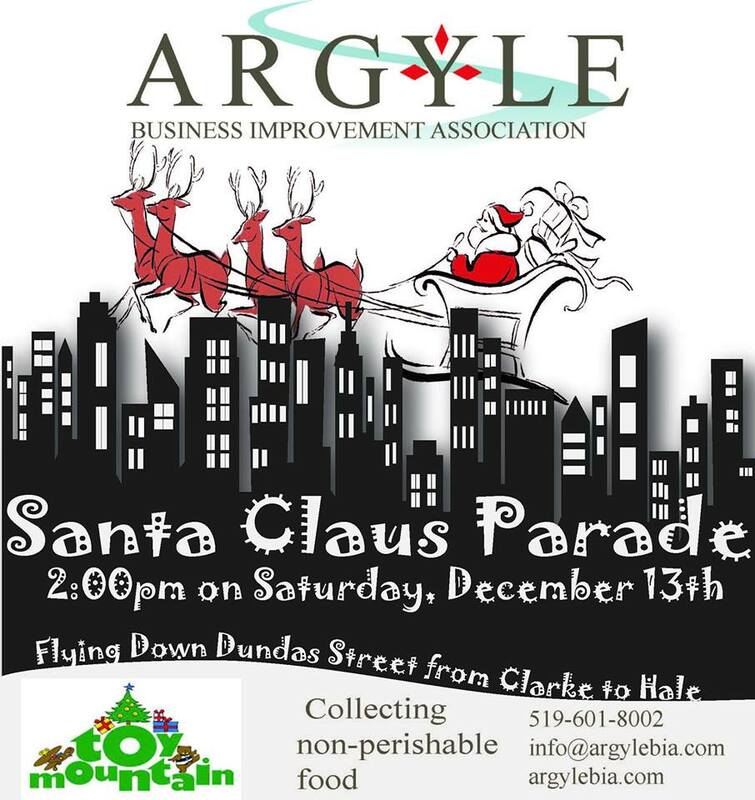 parade is brought to you by the Argyle Business Improvement Area in the east end of London. The day begins early with a free breakfast of pancakes, fruit, tea and coffee. 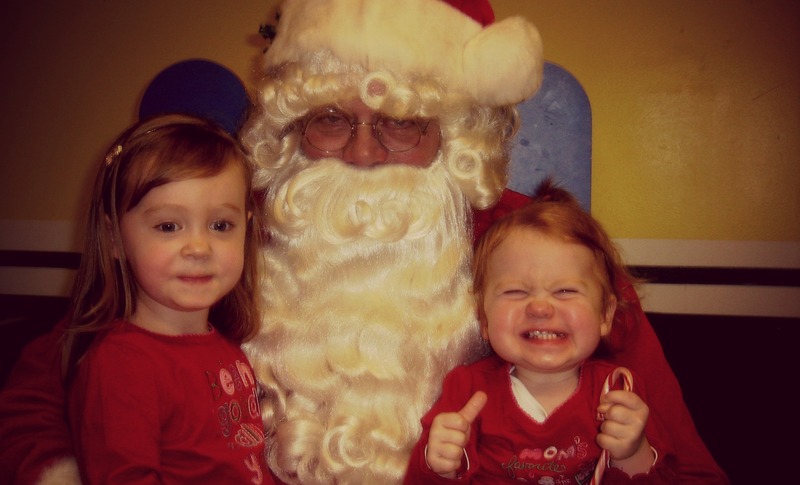 From 9:00am to 11:30am you can drop in and say hello to Santa Claus while you eat! Breakfast will be held at Clarke Road Secondary School (300 Clarke Road). The Knights are playing twice this weekend! The puck drops at 7:30pm on Friday, December 12 and again at 2:00pm on Sunday, December 14. Go cheer on the boys in green! The young country sensation is coming to the Bud this Saturday, December 13 at 7:00pm. There are a few tickets still available if you act fast. Santa Claus, crafts with the elves, marshmallows over an open fire, outdoor skating… this is the place to be for families this weekend! This is the time of year when kids of all ages are excitedly dictating or penning their own letters to Santa Claus. In the age of electronics, the old pencil and paper method is not the only way to get your letters through to the Head Elf though! Here are some cool ideas for your kids this Christmas. Santa Claus has gone digital! After the kids go to bed, Mom or Dad can email Santa by going to the link above (it’s top secret though! Adults only!!) and letting Santa know what their child/ren have been up to this past year. Santa will then email a personal video message to each child! This is a great way to get them engaged with Santa Claus. Using the PNP is free for the Classic version or you can upgrade for the Premium video. 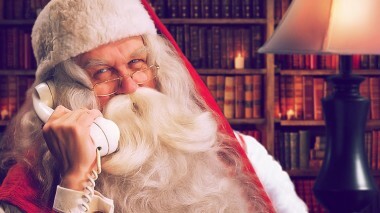 Go even a little further and you have the option of getting a personal phone call from Santa to your child. For quick and easy messaging to the North Pole, you can send Santa a fill-in-the-blank online form and he will respond right away! Try HERE, HERE or HERE. When messaging Santa online though, make sure you’re not communicating with a naughty elf! There have been some warnings lately about companies pretending to be Santa Claus. Have a read through this for some insight. Storybook Gardens skate trail opens this Saturday, as long as the weather continues to cooperate! Skating is from 10:00am to 8:00pm Saturday and 10:00am to 5:00pm Sunday. Admission is $4.25 for adults, $3.25 for children, or $13.00 for a family (2 adults, 2 children). The Amabile Da Copa Choir and Junior Amabile Singers will definitely get you into the holiday spirit with their performance of Storytellers this Saturday, December 6, at 6:00pm at St. James Presbyterian Church. If your kids can’t wait until the big day to sneak a peek at the big guy, have their photo taken in support of the London Defeat Depression Campaign this Saturday, December 6 from 1:00 to 4:00pm at La Noisette Bakery on Oxford Street East. For more information, see their Facebook Event. If you can’t make it, see our rundown of the mall hours HERE. Country star Dirks Bentley is coming to the Budweiser Gardens this Saturday night. Randy Houser and Tim Hicks are opening; the show starts at 7:30pm. There are a few rare tickets still floating around for sale, so if you are interested act fast! The Eldon House is opening their doors for a festive tea and tour of the house during their Victorian Christmas Celebration. There will be two sittings this Sunday at 1:30pm and 3:00pm. Admission is $12 for adults and $6 for children. To register call 519-661-5169. London is going to be a busy place this weekend! Get the kids in the van and get out there! Friday, November 28 in Victoria Park there will be the annual Lighting of the Lights ceremony to mark the beginning of the Christmas season in the downtown core. Events run from 6:15 to 7:00pm. This Saturday, November 29 beginning at 10:00am behind Sherwood Forest Mall. Bring canned good donations for the elves to collect and dress warmly! The legendary movie turned Broadway sensation will hit the McManus Stage at the Grand Theatre from November 25 to December 6. Tickets are $25 each and can be purchased at the Grand Theatre box office or online HERE. The Hyde Park Santa Claus Parade is happening this weekend. Families in London are quite divided on which parade is their favourite – the traditional London parade which takes place in the evening and is in early November or the newer Hyde Park parade which happens during the day, later in November. If you prefer a parade during daylight, get ready for fun! It’s that time of year again! It may only be the beginning of November, but according to the retail world, the Christmas season is upon us. As a wholehearted lover of Christmas, I embrace the early start! And what better way to kick it off than with the annual London Santa Claus Parade? While many things change, the London Santa Claus Parade is not one of them. The parade I take my children to every year is in fact very similar to the parade that I went to as a child – the same marching bands, the same kitschy-fabulous floats, the same clowns, and even the same Ghostbusters Ecto-1! The charm of the old parade is, for me, the nostalgia of a simpler time when the pure excitement of that first glance of Santa Claus was enough to make the night a flawless success. Will you be there? I sure will be! WHAT: This year’s theme is Eh Canadian Christmas! WHEN: This Saturday, November 8. The parade begins at 6:00pm heading down Dundas Street from Egerton. WHERE: Whether you are going or not, you will want to be aware of the PARADE ROUTE down QUEENS AVE from Quebec Street to Ridout Street** for Saturday evening. The route is often blocked off in advance of the parade due to the volume of pedestrians on the streets. Please plan your travel/parking in advance to keep everyone safe! **Note that the route has changed this year! As in previous years, the London Santa Claus Parade will be collecting for various charities and causes. Please watch for the official Santa Claus Parade collectors! TOONIE TOSS: The Beta Sigma Phi Sorority will be collecting toonies (or any other cash,change, etc) to be put towards the cost of running the parade. Donations ensure that the parade comes back every year! 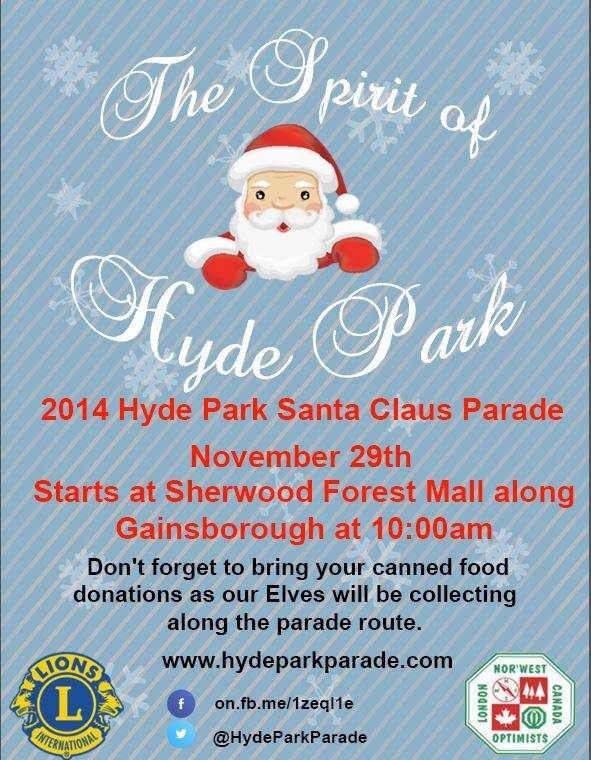 FOOD BANK DONATIONS: Non-perishable food items will be collected during the parade and donated to the London Food Bank. Last year over 14 000 lbs of food was donated during the parade! AND FOR YOURSELF… there are often organizations or coffee shops open along route selling hot chocolate, coffee, and treats, but if you have any Halloween candy lying around still, it might be a good idea to grab a handful or two (or a healthy snack!) to keep the kids happy. Pace yourself with the drinks though, toilets are hard to come by. Please remember to make space for the children. Be mindful of where you are sitting and be aware of blocking other people’s view or taking up too much of that precious curb real estate. Get cozy! Start spreading that Holiday cheer early and be kind to others. The Parade Officials are also asking that you bring rain gear instead of umbrellas if necessary, do not smoke along the parade route, and respect the officials. Dress very warmly, bring blankets and/or fold-able chairs to sit on, and your camera! These are memories your children will treasure. Here is the best of London for the weekend of November 7-9, 2014. On Friday night the London Knights are taking on the Windsor Spitfires at 7:30pm. Sunday afternoon at 2:00pm the London Lightning play the Brampton A’s. For tickets head to the Bud Garden’s website. The parade will be going through downtown London this Saturday night, November 8, beginning at 6:00pm. This weekend is London’s annual Holiday Home Tour in support of Thames Valley Children’s Centre. Each year, selected homeowners in London open their home to the city’s top designers and florists to have their house decorated in beautiful holiday themes for this tour. This is a wonderful event that directly benefits so many programs and services for children with disabilities in London. The Original Kids Theatre Company is putting on a production of Crazytown this weekend at the Spriet Theatre, Covent Garden Market. This play is a comedy for the whole family! Tickets can be purchased at the door or online in advance. Canadale Nurseries in St. Thomas will be celebrating with a Christmas Open House each weekend in November. There will be activities for the whole family, including meeting Santa’s real live reindeer and pictures with Mr. and Mrs. Clause. Notre Dame Catholic School at 767 Valetta Street is having a one-stop shopping event on Saturday, November 8 from 9:00am to 3:00pm. There will be lots of vendors with unique gifts to choose from. Get your Christmas shopping started early! Admission is $2 (children are free!) which includes a door prize ticket. The fourth annual Mount Zion Christmas Market will be held this Saturday from 10:00am to 2:00pm at 471 Ridgewood Crescent. There will be many vendors, as well as door prizes, a bake table, and a tea room. Mike Lawson will also be there to buy your unwanted silver and gold!